A Zeppola (plural Zeppole), also called Sfinge in Rome is a pastry typical of Italian cuisine. 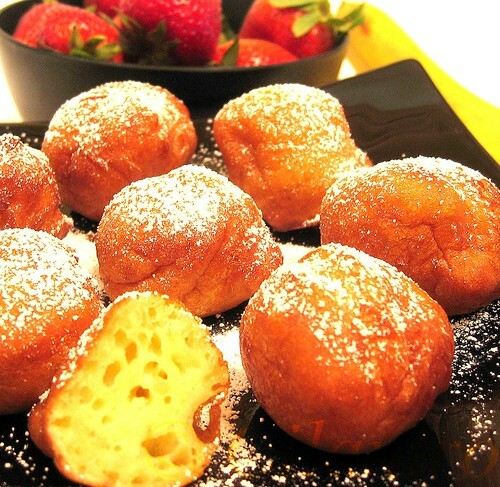 Commonly light, deep-fried dough balls, these doughnuts or fritters are usually topped with powdered sugar and may be filled with custard, jelly, cannoli-style pastry cream or a butter-and-honey mixture. Their consistency ranges from light and puffy, to bread or pasta-like. Zeppoli are traditionally consumed on Saint Joseph’s Day. In Rome, Naples and Sicily, these little pastries are sold on many streets and are offered as gifts on this day. Cilantro~nised Zeppole with Banana is an India Inspired, Italian Dessert very similar to Appam OR Paniyaram ~ a deep-fried dough balls with banana, rice flour or maida and sugar. This is Giada`s Apple Zeppole recipe on Food Network with a little variation of Banana to give an Indian Twist. In a medium sauce pan combine the butter, salt, sugar and water over medium heat. Bring to a boil. Take pan off the heat and stir in the flour. Return the pa n to medium heat and stir continuously until mixture forms a ball, about 3 to 5 minutes. Transfer the flour mixture to a medium bowl. Using an electric hand mixer on low speed, add eggs, one at a time. Beat until smooth. Add the mashed banana and stir to combine. Heat enough oil into a kadai/ pan. Using a small ice-cream scooper or small spoon, carefully drop about a rounded tablespoon of the dough into the hot olive oil. Turn the zeppole once or twice, and cook until golden and puffed up, approximately 4 minutes. Fry the zeppole in batches and drain on paper towels. Transfer the zeppole to a serving dish and sprinkle with powdered sugar using a small sieve. Serve with whipped cream . This recipe serves four. Zeppole looks great. The addition of banana sounds great. Nice pics. I saw that episode. I would have tried this had it not involved frying! The look so soft and fluffy. Excellent pictures. Thank You Suganya and Madhuram. TBC, you can also bake the Zeppole if you prefer not to deep fry. I will be glad to include my recipe in your blog. Thanks for visiting my site and thanks for asking. the zeppole looks really good...do you think that I can try it without the banana though...or is the banana the main flavor...I think that your recipe is cool and I think that I cam going to add on to it!! !